Tofu, also tōfu (the Japanese Romaji spelling), doufu (the Chinese Pinyin spelling often used in Chinese recipes) or bean curd (the literal translation), is a food of Chinese origin, made by coagulating soy milk, and then pressing the resulting curds into blocks. There are many different varieties of tofu, including fresh tofu, tofu processed or preserved in a variety of ways, and tofu by-products such as tofu skins and soy pulp (Japanese: okara). Tofu has very little flavor or smell on its own, so it can be used either in savory or sweet dishes, and is often seasoned or marinated to suit the dish. Some tofu is made by processing non-soy products, such as almonds or black beans. Tofu originated in ancient China, but little else is known about the origins of tofu and its method of production. Tofu and its production technique were introduced into Japan in the Nara period (late eighth century), and spread to other parts of East Asia, where it has become a core ingredient of many cuisines. Tofu is low in calories, contains beneficial amounts of iron (especially important for women of child-bearing age) and has no saturated fat or cholesterol. Depending on the coagulant used in manufacturing, the tofu may also be high in calcium (important for bone development and maintenance), and magnesium (especially important for athletes). Tofu also contains soy isoflavones, which can mimic natural human estrogens and may have a variety of harmful or beneficial effects when eaten in sufficient quantities. The English word "tofu" comes from the Japanese tōfu (豆腐), which derives from the Chinese dòufǔ (豆腐 or 荳腐). Although in both languages the characters together translate as "bean curd," the literal meaning of the individual characters is "bean" (豆) and "curdled" (腐). Tofu originated in ancient China. There are many theories regarding the origins of tofu, but little historical information to prove or disprove them. It is known that tofu was widely consumed in ancient China, and that techniques for its production and preparation eventually spread to many other parts of Asia. The most common theory about the origin of tofu origin maintains that it was invented in northern China around 164 B.C.E. by Lord Liu An, a Han Dynasty prince. Chinese folklore often attributes important inventions to well-known historical figures; techniques of tofu production probably existed long before this time. Another theory is that the method for producing tofu was discovered accidentally when a slurry of boiled, ground soybeans was mixed with impure sea salt, containing calcium and magnesium salts, which caused the soy mixture to curdle and produce a tofu-like gel. Soy milk has been eaten as a savory soup since ancient times. A third theory maintains that the ancient Chinese learned the method for the curdling of soy milk by emulating the milk curdling techniques of the Mongolians or East Indians. Despite their advancement, no technology or knowledge of culturing and processing milk products existed within ancient Chinese society. The primary evidence for this theory lies in the etymological similarity between the Chinese term for Mongolian fermented milk (rufu, which literally means "milk spoiled") and the term doufu or tofu. Tofu is known to have been a commonly consumed food in China by the second century B.C.E. 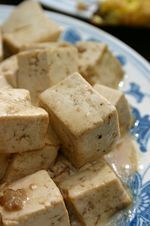 Although the varieties of tofu produced in ancient times may not have been identical to those of today, descriptions from writings and poetry of the Song and Yuan Dynasties show that the technique for the production of tofu had already been standardized by that time. In China, tofu is traditionally presented as a food offering when visiting the graves of deceased relatives. According to tradition, tofu is the only food soft enough for the spirits (or ghosts), who have long ago lost their chins and jaws, to eat. Before refrigeration was available in China, tofu was often sold only during the winter time. During the warmer months, leftover tofu would be spoiled if not consumed within a day. Tofu and its production technique were introduced into Japan in the Nara period (late eighth century) as well as to other parts of East Asia. The earliest documented record of tofu in Japan shows that the dish was served as an offering at the Kasuga Shrine in Nara in 1183. The rise in acceptance of tofu may have coincided with the rise of Buddhism, as tofu is an important source of protein in a vegetarian diet. The book Tofu Hyakuchin (豆腐百珍), published during the Edo period, lists 100 recipes for cooking tofu. Tofu has become a staple in many countries, including Vietnam, Thailand, and Korea, with subtle regional variations in methods of production, texture, flavor, and usage. The production of tofu from soy milk is similar to the production of cheese from milk. Tofu is made by coagulating soy milk and pressing the resulting curds. Although commercial soy milk may be used, most tofu producers begin by making their own soy milk, produced by soaking, grinding, boiling, and straining dried (or, less commonly, fresh) soybeans. Some non-soy products, such as almonds or black beans, are also processed to make tofu. Coagulation of the protein and oil (emulsion) suspended in the boiled soy milk is the most important step in the production of tofu. This process is accomplished with the aid of coagulants. Two types of coagulants, salts and acids, are used for commercial production. A third type of coagulant, enzymes, is not yet used commercially but shows potential for producing both firm and "silken" tofu. Calcium sulfate (gypsum): The traditional and most widely used coagulant to produce Chinese-style tofu is calcium sulfate, which produces a tofu that is tender but slightly brittle in texture. The coagulant itself has no perceptible taste. Use of this coagulant also makes a tofu that is rich in calcium, an important mineral for treating and preventing osteoporosis. Many tofu manufacturers use calcium sulfate so that they can market their tofu as a good source of calcium. Chloride-type Nigari salts or Lushui (卤水 in Chinese) - Magnesium chloride and calcium chloride: Both of these salts have a high solubility rate in water and affect soy protein in the same way; gypsum is only very slightly soluble in water and acts differently in soy protein precipitation. These coagulants produce tofu with a smooth and tender texture. In Japan, a white powder called nigari (lushui, 卤水, in China), which consists primarily of magnesium chloride, is produced from seawater after the sodium chloride is removed and the water evaporated. Depending on how it is produced, nigari/lushui may also contain small quantities of magnesium sulfate (Epsom salt), potassium chloride, calcium chloride, and trace amounts of other naturally occurring salts. Although the term nigari is derived from nigai, the Japanese word for "bitter," neither nigari nor pure magnesium chloride imparts a perceivable taste to the finished tofu. Calcium chloride is commonly used as a coagulant for tofu in North America. Glucono delta-lactone (GDL): A naturally occurring organic acid also used in cheese making, GDL produces a very fine-textured tofu that is almost jelly-like. This coagulant is used especially for "silken" and softer tofus, and gives the finished product an almost imperceptible sour taste. GDL is commonly used together with calcium sulfate, to give soft tofu a smooth tender texture. Among enzymes that have been shown to produce tofu are papain, and alkaline and neutral proteases from microorganisms. In the case of papain, the enzyme to substrate ratio, by weight, was held constant at 1:400. An aliquot of 1 percent crude papain was added to "uncooked" soy milk at room temperature and heated to 90–100 degrees Celsius. Contemporary tofu manufacturers may use a combination of these coagulants to produce a desired texture in the finished tofu. Different textures result from a difference in pore sizes and other microscopic features in the tofus produced using each coagulant. The coagulant mixture is dissolved in water, and the solution is then stirred into boiled soy milk until the mixture curdles into a soft gel. The curds are processed differently, depending on the form of tofu that is being manufactured. For soft silken tofu (嫩豆腐; nèn dòufǔ) or tofu flower (豆花, dòuhuā), the soy milk is curdled directly in the container in which the tofu will be sold. For standard firm Asian tofu, the soy curd is cut and excess liquid is strained off using cheese cloth or muslin, then the curds are lightly pressed into a soft cake. Firmer tofus, such as Asian dry tofu (荳乾) or Western types of tofu, are pressed to remove even more liquid. In Vietnam, the curd is strained and molded in a square mold, and the end product is called đậu khuôn (molded bean) or đậu phụ (one of the Vietnamese ways to pronounce the Chinese “doufu”). The tofu curds are allowed to cool and become firm. The finished tofu can then be cut into pieces, flavored or further processed. Although tartness is sometimes desired in dessert tofu, the acid used for flavoring is typically not the primary coagulant, since a concentration of acid high enough to induce coagulation would produce an unpleasant flavor and texture. A sour taste in tofu and a slight cloudiness in the liquid around are an indication of bacterial growth and spoilage. Many varieties of tofu are available in both Western and Eastern markets. Tofu products can be categorized either as fresh tofu, which is produced directly from soy milk, or as processed tofu, which is produced from fresh tofu. Tofu production also creates important side products which are used in various cuisines. A byproduct of the process is soy pulp (also called okara in Japanese). Soft/silken tofu (嫩豆腐 or 滑豆腐, nèn dòufǔ or huá dòufǔ, in Chinese, lit. "soft tofu" or "smooth tofu"; 絹漉し豆腐, kinugoshi tōfu in Japanese, lit. "silk-filtered tofu"; 순두부, 純豆腐, sundubu in Korean, lit. "pure tofu"): This undrained tofu contains the highest moisture content of all fresh tofus. Its texture can be described as similar to that of very fine custard. In Japan and Korea, traditional soft tofu is made with seawater. Douhua (豆花, dòu huā or 豆腐花, dòufǔ huā in Chinese), or tofu brain (豆腐腦 or 豆腐脑, dòufǔ naǒ in Chinese), often eaten as a dessert, but sometimes with salty pickles or hot sauce added instead, is another type of soft tofu with an even higher moisture content. Because it is nearly impossible to pick up this type of tofu with chopsticks, it is generally eaten with a spoon. Edamame tofu is a Japanese variety of kinugoshi tōfu made from edamame (fresh green soybeans); it is pale green in color and often studded with whole edamame. Asian firm tofu (simply called 豆腐 lǎo dòufǔ in Chinese; 木綿豆腐, momendōfu in Japanese, lit. "cotton tofu"): Although drained and pressed, this form of fresh tofu still contains a considerable amount of moisture. It has the firmness of raw meat, but bounces back readily when pressed. The texture is similar to a firm custard. The skin retains the pattern of the muslin used to drain it. Firm tofu can be picked up easily with chopsticks. Western firm/dried tofu (豆乾, dòu gān in Chinese, lit. "dry tofu"): An extra firm variety with the least amount of moisture, it has the firmness of fully cooked meat, and a somewhat rubbery feel. The skin of retains the pattern of the muslin used to drain and press it. When milled and re-formed after pressin it sometimes lacks the skin with its cloth patterning. One variety pressed flat and sliced into long strings smaller than 2 mm × 2 mm, called shredded dried tofu (豆乾絲, dòu gān sī in Chinese, or simply 乾絲, gān sī), looks like loose cooked noodles, and can be served cold, stir-fried, or similar in style to Japanese aburaage. Fresh tofu is usually sold completely immersed in water to maintain its moisture. Many forms of processed tofus exist. Some of these processing techniques probably originated from the need to preserve tofu before the days of refrigeration, or to increase its shelf life and longevity. Other production techniques are employed to create tofus with unique textures and flavors. Pickled tofu (豆腐乳 in Chinese, pinyin: dòufǔ rǔ, lit. "tofu dairy," or 腐乳; chao in Vietnamese): Also called "preserved tofu" or "fermented tofu," this food consists of cubes of dried tofu that have been allowed to fully air-dry under hay and slowly ferment from aerial bacteria. The dry fermented tofu is then soaked in salt water, Chinese wine, vinegar, and minced chiles, or a unique mixture of whole rice, bean paste, and soybeans. In the case of red pickled tofu (紅豆腐乳 in Chinese, Pinyin: hóng dòufǔ rǔ), red yeast rice (cultivated with Monascus purpureus) is added for color. Stinky tofu (臭豆腐 in Chinese, Pinyin: chòu dòufǔ): A soft tofu that has been fermented in a unique vegetable and fish brine. The blocks of tofu smell strongly of certain pungent cheeses, and are described by many as rotten, but the flavor and texture of stinky tofu is appreciated by aficionados, who describe it as delightful. The rind that stinky tofu develops from frying is said to be especially crisp, and is usually served with soy sauce, sweet sauce, and/or hot sauce. Flavors can be mixed directly into the curdling soy milk while tofu is being produced. Sweet: Common sweet dessert tofus include peanut tofu (落花生豆腐, luòhuāshēng dòufǔ in Chinese and jimami-dōfu in Japanese), almond tofu (杏仁豆腐, xìngrén dòufǔ in Chinese; 杏仁豆腐, annindōfu in Japanese), mango tofu, and coconut tofu. In order to produce these forms of tofu, sugar, fruit acids, and flavorants are mixed into soy milk prior to curdling. Most sweet tofus have the texture of silken tofu and are served cold. 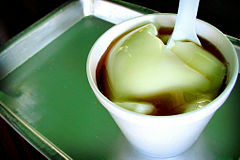 Products called "almond tofu" in some cases are actually not made from tofu, but are instead gelatinous desserts made from agar or gelatin and whitened with milk or coconut milk. In Japan these are canned with syrup and sold as a sweet dessert. Savory: Egg tofu (Japanese: 玉子豆腐, 卵豆腐, tamagodōfu) (Chinese: 蛋豆腐, dàn dòufǔ; often called 日本豆腐, rìbĕn dòufǔ, lit. "Japan bean curd") is the main type of savory flavored tofu. Whole beaten eggs are filtered and incorporated into the soy milk before the coagulant is added. The mixture is filled into tube shaped plastic bags and allowed to curdle. The tofu is then cooked in its packaging and sold. Egg tofu has a pale golden color that can be attributed to the addition of egg and, occasionally, food coloring. This tofu has a fuller texture and flavor than silken tofu, which can be attributed to the presence of egg fat and protein. With the exception of the softest tofus, all forms of tofu can be fried. Thin and soft varieties of tofu are deep fried in oil until they are light and airy in their core (豆泡 in Chinese, dòupào, lit. "bean bubble," describing the shape of the fried tofu as a bubble). Tofus with lower moisture content, such as firm Asian and dry tofus, are cut into bite-sized cubes or triangles and deep fried until they develop a golden-brown, crispy surface (炸豆腐 in Chinese, zhà dòufǔ, lit. "fried tofu"). These may be eaten by themselves or with a light sauce, or further cooked in liquids; they are also added to hot pot dishes, and are included as part of the vegetarian dish called "Buddha's delight" (luohan zhai). 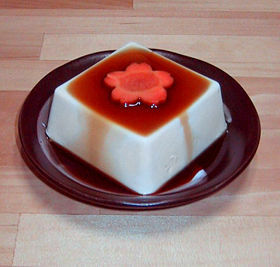 Thousand layer tofu (千葉豆腐, 凍豆腐 or 冰豆腐 in Chinese, lit. "thousand layer tofu" or "frozen tofu"): When tofu is frozen, the large ice crystals that develop within it form large cavities that appear to be layered (pseudostratified). The frozen tofu takes on a yellowish hue during the freezing process. “Thousand-layer tofu” is commonly made at home by freezing Asian soft tofu, though it is also commercially sold as a regional specialty in parts of Taiwan. This tofu is defrosted and sometimes squeezed of moisture prior to use. Koyadofu (kōyadōfu, 高野豆腐 in Japanese): The name comes from Mount Koya, a center of Japanese Buddhism famed for its shōjin ryōri, or traditional Buddhist vegetarian cuisine. It is sold in freeze-dried blocks or cubes in Japanese markets. It must be soaked in water before eating, and is typically simmered in dashi, sake or mirin and soy sauce. In shōjin ryōri, vegetarian kombu dashi, made from seaweed, is used. When prepared in the usual manner, it has a spongy texture and mild sweet, savory flavor. A similar form is found in instant soups (such as miso soup), in which the toppings are freeze-dried and stored in sealed pouches. Tofu production creates some edible byproducts. Food products are made from the protein-oil film, or "skin," which forms over the surface of boiling soy milk in an open shallow pan. The solids left over from pressing soy milk are called okara. Boiling of soy milk, in an open shallow pan, produces a film or skin composed primarily of a soy protein-lipid complex on the liquid surface. The films are collected and dried into yellowish sheets known as soy milk skin (腐皮, fǔ pí in Chinese; 湯葉, yuba in Japanese). Its approximate composition is: 50–55 percent protein, 24–26 percent lipids (fat), 12 percent carbohydrate, 3 percent ash, and 9 percent moisture. The skin can also be bunched up in stick form and dried into something known as "tofu bamboo" (腐竹, fǔ zhú in Chinese; phù chúc in Vietnamese; kusatake, Japanese). 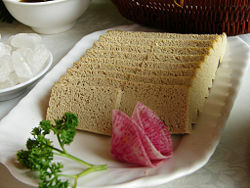 Tofu skin, with its soft yet rubbery texture, is folded or shaped into different forms and cooked further to imitate meat in vegetarian cuisine. Okara (雪花菜, xuě huā caì, lit. "snowflake vegetable"; 豆腐渣, dòufǔ zhā, lit. "tofu sediment/residue"; kongbiji, 콩비지 in Korean), sometimes known in the west as soy pulp, is the fiber, protein, and starch left over when soy milk has been extracted from ground, soaked soybeans. Although it is mainly used as animal feed in most tofu producing cultures, it is sometimes used in Japanese and Korean cuisines. It is also an ingredient for vegetarian burgers produced in many western nations. Black bean tofu (黑豆花): A type of tofu made from plain black beans and soybeans, which is usually made into dòuhuā (豆花) rather than firm or dry tofu. The texture of black bean tofu is slightly more gelatinous than regular tofu flower, and the color is grayish. This type of tofu is eaten for the earthy "black bean taste." Burmese tofu (to hpu in Burmese): A type of tofu made from gram (besan) or chickpea (chana dal) flour instead of soybeans; the Shan variety uses yellow split pea flour instead. Both types are yellow in color and generally found only in Myanmar, though the Burman variety is also available in some overseas restaurants serving Burmese cuisine. To hpu may be fried as fritters cut in rectangular or triangular shapes; the latter fried twice, hence the name hnapyan gyaw (literally "twice fried"), is the common form in the Shan States. To hpu nway, creamy and soft before it sets, is also popular served hot on its own or with rice noodles. To hpu gyauk, which are deep fried, thin, and crispy, are similar to prawn or fish crackers. Rice tofu, called hsan to hpu (or hsan ta hpo in Shan regions) is made from rice flour (called hsan hmont or mont hmont) and is white in color, with the same consistency as yellow Burmese tofu when set. It is eaten as a salad in the same manner as yellow tofu. Tofu has very little flavor or smell of its own and can be prepared either in savory or sweet dishes, acting as a complement to the flavors of the other ingredients used. In Asian cuisine, tofu is served raw, stewed, stir-fried, in soup, cooked in sauce, or stuffed with fillings. The light, greenish "bean" smell of tofu is much enjoyed in East Asian cuisines and fresh tofu is often eaten plain or simply flavored. In Japan, a common lunch in the summer months is hiyayakko (冷奴), silken or firm Asian tofu served with freshly grated ginger, scallions, katsuobushi (dried salmon) shavings and soy sauce. In many parts of China, fresh tofu is similarly eaten with soy sauce, century eggs (皮蛋), and sesame seed oil. Dòuhuā (豆花), is a soft tofu dish. The fresh tofu is served warm and dressed with sweet syrup. Lamma Island, Hong Kong. In Chinese cuisine, Dòuhuā (豆花) is served with toppings like boiled peanuts, azuki beans, cooked oatmeal, tapioca, mung beans and a syrup flavored with ginger or almond. During the summer, dòuhuā is served with crushed ice; in the winter, it is served warm. In Korean cuisine, dubu jorim consists of cubes of firm tofu that are pan fried and seasoned with soy sauce, garlic, and other ingredients. Cubes of cold, uncooked tofu seasoned with soy sauce, scallions, and ginger, prepared in a manner similar to Japanese hiyayakko, are also enjoyed. In the Philippines, the sweet delicacy taho is made of fresh tofu with brown sugar syrup and sago. In Vietnam, dòuhuā is pronounced đậu hủ. This variety of soft tofu is made and carried around in an earthenware jar. It is scooped into a bowl with a shallow, flat spoon, and is served with either powdered sugar and lime juice, or with a ginger-flavored syrup. It is generally eaten hot, even during summer. A common cooking technique in many parts of East and Southeast Asia involves deep frying tofu in vegetable oil, sunflower oil, or canola oil. Although tofu is often sold preprocessed into fried items, pre-fried tofu is seldom eaten directly and requires additional cooking. Depending on the type of tofu used, the texture of deep fried tofu may range from crispy on the outside and custardy on the inside, to puffed up like a plain doughnut. The former is usually eaten plain in Chinese cuisine with garlic soy sauce, while the latter is either stuffed with fish paste (surimi) or cooked in soups. In Japan, cubes of lightly coated and fried tofu topped with a kombu dashi-based sauce are called agedashi-dofu (揚げ出し豆腐). Soft tofu that has been thinly sliced and deep fried, known as aburage in Japan, is commonly blanched, seasoned with soy sauce and mirin and served in dishes such as kitsune udon. Aburage is sometimes soaked in a sweet syrup and cut open to form a pocket; stuffed with sushi rice, this dish is called inarizushi (稲荷寿司) . A well-known hot Sichuan preparation using firm Asian tofu is mápó dòufu (麻婆豆腐). Tofu and beef are braised in a sauce of chili, ginger and fermented bean paste. In the Shanghai region it is called málà dòufǔ (麻辣豆腐). Dried tofu is usually not eaten raw, but stewed in a mixture of soy sauce and spices. Some types of dried tofu are pre-seasoned with special blends of spices, so that the tofu may either be called "five spice tofu" (五香豆腐) or "soy sauce stewed tofu" (鹵水豆腐). Dried tofu is typically served thinly sliced with chopped green onions or with slices of meat for added flavor. Most dried tofu is sold after it has been fried or stewed by tofu vendors. Soft tofu can also be broken up or mashed and mixed with raw ingredients prior to being cooked. For example, Japanese ganmodoki is a mixture of chopped vegetables and mashed tofu. The mixture is bound together with starch and deep fried. Chinese families sometimes make a steamed meatloaf or meatball dish from equal parts of coarsely mashed tofu and ground pork. In India, tofu is also used as a low-fat replacement for paneer, providing the same texture with similar taste. Tofu bamboos are often used in lamb stew or in a dessert soup. Tofu skins are often used as wrappers in dim sum. Freeze-dried tofu and frozen tofu are rehydrated and enjoyed in savory soups. These products are often taken along on journeys; a small bag of dried tofu can provide protein for many days. In Korean cuisine, soft tofu (sundubu in Korean) is used to make a thick soup called sundubu jjigae (순두부 찌개). Pickled tofu is commonly used in small amounts together with its soaking liquid to flavor stir-fried or braised vegetable dishes (particularly leafy green vegetables like water spinach). It is often eaten directly as a condiment with rice or congee. Firm tofu can be used for kebabs, mock meats, and dishes requiring a consistency that holds together, while the softer styles can be used for desserts, soups, shakes, and sauces. Before grilling, firm tofu is usually marinated overnight. Grated firm western tofu is sometimes used in conjunction with TVP (textured vegetable protein) as a meat substitute. Softer tofus are sometimes used as a dairy-free or low-calorie filler, or made into ice cream substitutes. Silken tofu may be used to replace cheese in certain dishes (such as lasagna) or incorporated into Indian-style curries. Tofu and soy protein can be industrially processed to match the textures and flavors of cheese, pudding, eggs, or bacon. Tofu's texture can also be altered by freezing, pureeing, and cooking. In the Americas, Europe, Australia and New Zealand, tofu is frequently associated with vegetarianism and veganism as a source of high-quality, non-animal protein. Tofu is low in calories, contains beneficial amounts of iron (especially important for women of child bearing age) and has no cholesterol (a risk factor for heart disease). Depending on the coagulant used in manufacturing, the tofu may also be high in calcium (important for bone development and maintenance), and magnesium (especially important for athletes). Tofu is relatively high in protein, about 10.7 percent for firm tofu and 5.3 percent for soft "silken" tofu with about 2 percent and 1 percent fat respectively as a percentage of weight. In the East, tofu may be produced locally by relatively small vendors or distributed nationwide by large manufacturers. Fresh tofu is usually bought from local vendors and is sold directly from large bins or pots at street markets. Asian firm tofu and "tofu flower" are commonly sold in this manner and are usually no more than a few hours old. Tofu sold by large manufacturers often comes packaged in sealed plastic cartons or tubes, and may be, at most, two weeks old. In Chinese supermarkets, tofu can be found in many different flavors and grades of consistency. Most silken and flavored tofus are produced by large factories. In Japan, silken tofu without preservatives is made daily and must be sold within two days. In the West, tofu can be obtained in Asian markets, farmers' markets, and health food stores. Depending on its local popularity, many grocery stores also stock tofu. ↑ American Heritage Dictionary of the English language (Boston: Houghton Mifflin, 2006, ISBN 0395825172). ↑ History of Tofu. Soya. Retrieved December 16, 2015. ↑ 3.0 3.1 3.2 3.3 3.4 3.5 William Shurtleff and Akiko Aoyagi, The Book of Tofu. Volume 1, Food for Mankind (Brookline, MA: Autumn Press, 1975, ISBN 0914398059). History of Tofu Retrieved June 27, 2008. ↑ Korean sundubu (soft tofu) is still produced in a similar manner, using seawater as a coagulant. ↑ Donald Richie, A Taste of Japan (Kodansha, 2001, ISBN 4770017073). ↑ 7.0 7.1 Zeki Berk, "Technology of production of edible flours and protein products from soybeans." Retrieved December 16, 2015. FAO agricultural services bulletin, (Rome: Food and Agriculture Organization of the United Nations, 1992. ISBN 978-9251031186). ↑ 8.0 8.1 KeShun Liu, Soybeans: Chemistry, Technology, and Utilization (Springer, 1997, ISBN 978-0834212992). ↑ 9.0 9.1 Shun-Tang Guo and Tomotada Ono, “The Role of Composition and Content of Protein Particles in Soymilk on Tofu Curding by Glucono-δ-lactone or Calcium Sulfate,” Journal of Food Science 70 (4) (2005): 258–262. Retrieved June 27, 2008. ↑ William Shurtleff and Akiko Aoyagi, The Book of Tofu & Miso (Berkeley, CA: Ten Speed Press, 2000). ↑ New tofu production method. Food Production Daily. Retrieved June 27, 2008. ↑ Deep Seawater Business To Develop Local Economies Japan for Sustainability. Retrieved June 27, 2008. ↑ William Shurtleff and Akiko Aoyagi, Volume IV, The History of Traditional Non-Fermented Soyfoods, Chapter 36 (2008) History of Tofu. Retrieved June 28, 2008. ↑ A photo of aburaage. Retrieved June 21, 2008. ↑ Shurtleff and Aoyagi, Volume V, The History of Traditional Fermented Soyfoods, Chapter 44: History of Fermented Tofu (2008). ↑ The Hwang Ryh Shang Company of Taiwan, a major producer of pickled tofu, mislabels this ingredient as "red date" (jujube) on the English-language list of ingredients on its product labels, although the Chinese list of ingredients on the same product lists 紅糟 (literally "red lees," (red yeast rice). ↑ Burmese tofu recipe Netcooks.com. Retrieved June 21, 2008. ↑ Catharina Y. W. Ang, KeShun Liu, and Yao-Wen Huang, Asian Foods: Science & Technology (Lancaster, PA: Technomic Publishing Co., 1999). ↑ Soy Protein and Soy Isoflavones Penn State College of Agricultural Science. Retrieved June 21, 2008. ↑ Frank M. Sacks, et. al., "Soy Protein, Isoflavones, and Cardiovascular Health" AHA Science Advisory Circulation 113 (2006): 1034-1044 Retrieved December 16, 2015. ↑ Kathleen Doheny, "Soy Claim as Heart Helper in Dispute" HealthDay News, 2006. Retrieved December 16, 2015. Anderson, J. W. B.M. Johnstone and M. E. Cook-Newell, Meta-Analysis of the Effects of Soy Protein Intake on Serum Lipids. New England Journal of Medicine 333 (5) (1995): 276–282. Ang, Catharina Y. W., KeShun Liu and Yao-Wen Huang. Asian Foods: Science & Technology. Lancaster, PA: Technomic Publishing Co., 1999. Berk, Zeki. 1992. Technology of production of edible flours and protein products from soybeans. FAO agricultural services bulletin 97. Rome: Food and Agriculture Organization of the United Nations. ISBN 978-9251031186. Grundy, Scott M., and James Cleeman, Stephen R. Daniels, Karen A. Donato, Robert H. Eckel, and Barry A. Franklin, "Diagnosis and Management of the Metabolic Syndrome. An American Heart Association/National Heart, Lung, and Blood Institute Scientific Statement." Circulation 112 (2005): 2735-2752. Guo, Shun-Tang, and Tomotada Ono, "The Role of Composition and Content of Protein Particles in Soymilk on Tofu Curding by Glucono-δ-lactone or Calcium Sulfate." Journal of Food Science 70 (4) (2005): 258–262. Retrieved December 14, 2015. Liu, KeShun. Soybeans: Chemistry, Technology, and Utilization. Springer, 1997. ISBN 978-0834212992. Sacks, Frank M. et al. Soy Protein, Isoflavones, and Cardiovascular Health. An American Heart Association Science Advisory for Professionals From the Nutrition Committee. Circulation 113 (7) (2006): 1034–1044. Shurtleff, William, and Akiko Aoyagi. Tofu & soymilk production: a craft and technical manual, 3rd ed. Lafayette, CA: Soyfoods Center, 2000. ISBN 978-1928914044. Shurtleff, William, and Akiko Aoyagi. A Comprehensive History of Soy. History of Soybeans and Soyfoods Past Present and Future. Lafayette, CA: Soyinfo Center, 2008. Retrieved December 14, 2015. White, L. R. et al. "Brain aging and midlife tofu consumption." Journal of the American College of Nutrition 19(2) (2000): 242–255. Tofu, The George Mateljan Foundation. This page was last modified on 16 December 2015, at 21:02.